So, let's talk power consumption. At moments of peak draw, NVIDIA's 7900GTX uses around 85 Watts of power. The gruntier ATI X1900XTX requires a rather heftier 120W, and the dual-VGA 7950GX2 needs a whopping 143W. Suffice it to say, graphics cards are drawing more power than ever before, and a highend SLI or CrossFire setup will double those needs. If the rest of your system is already using, say, 350W, you're going to need an almighty PSU. That's where FSP's new puppy comes in. 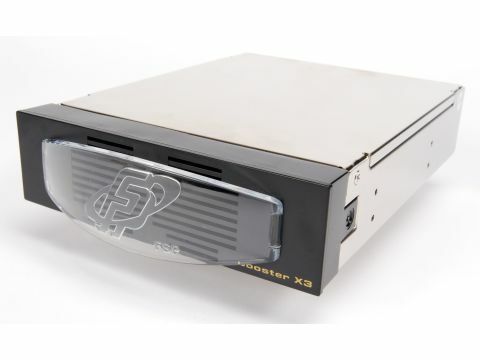 The Booster X3 is a supplementary PSU, designed specifically to power 3D cards. It slots into a 5.25" drive bay, with a power line-in that connects to your PC's back-plate, and from there to the mains. To power any graphics cards, it has two six-pin PCI-Express power-plugs, and a 300- Watt output. The theory is that you could run anything up to a Quad-SLI setup without encountering significant problems. Which, using the 7950GX2, would draw around 286W, without even tapping your standard PSU on the shoulder. Oh, and pimps will appreciate the soft blue glow that emanates from the front-panel of the unit, which sits jut above or below your optical drive, depending on where you decide to site it. In essence, it's a sterling concept, and it would be useful in situations where you want to upgrade your graphics card, but your PSU doesn't have the necessary power for the task. Branded, pre-built PCs, where the PSU isn't pokey enough for anything but the out-of the-box setup will benefit most from its grunt-injecting properties. However, the price makes it a problematic proposition. 70 clams is a tall order; that kind of money goes a long way in the PSU world. For example, £70 will net you an XClio 600W silent SLI power supply, which will power your entire system, plus a pair of fat cards. If the Booster X3 were half the price, we'd recommend anyone with upgrade worries to go and buy one immediately; and no doubt, prices will drop as time goes on.